Airplane neck pillows do nothing for me. I don’t understand why they are so popular. This head hammock on the other hand might be useful. And yeah, I couldn’t care less that it looks silly. That’s what happens when you reach your 40s. Haha I love it! And it would really creep your airplane neighbours out too which would provide entertainment on long flights. I personally am a fan of hinging at the waist then using the tray table and pillow as a kind of bed to rest my head on. Is that crazy? Its only drawback is when the person in front decides to recline their chair. This is perfect. This is exactly what I needed on my Hong Kong > NYC flight last week. I do this by using a big scarf and tying my head to the headrest. Look like a loon, but I sleep much better, and I refuse to pack extra stuff on a trip. 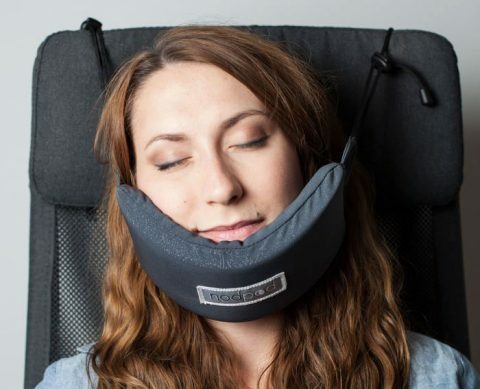 Turning the neck pillow to the side (or all the way around to the front) is the only way to go in my experience. Or when you reach your 27s.